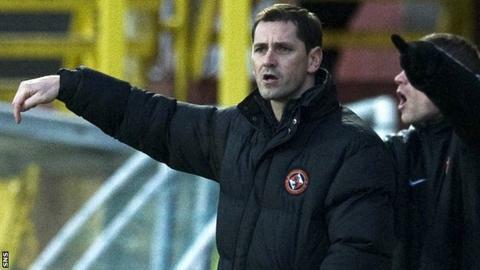 Dundee United manager Jackie McNamara felt his side could have pushed for a winner in their 2-2 draw with Hibernian at Tannadice. The Tayside outfit surrendered an early lead to trail 2-1, but claimed a point thanks to a controversial late penalty. "The negatives were losing two goals from set-pieces," said McNamara. "But the lads had attitude to keep going to the final whistle. Even at 2-2, we went to try and get the winner." Johnny Russell's late penalty earned United a point, but Pat Fenlon's side will feel aggrieved because Ryan McGivern's trip on Gary Mackay-Steven appeared to be outside the box. Earlier in the match, a clearance by Hibs keeper Ben Williams rebounded off John Rankin for United's opener before James McPake and Leigh Griffiths gave Hibs the lead. "I thought in the first half Hibs were a better team than us," said McNamara. "I don't think we played with any intensity. "Hibs harried us and won most of the second balls. In the second half, we were better, but we lost a poor goal to a set-piece." McNamara would not be drawn on whether he felt the late penalty that earned his side a point was deserved or not, but felt his players at least merited something from the game for their efforts. "To be honest, I didn't see if it was on the line or round about it," said McNamara. "But there were a few things I didn't think went our way today and that was one that was. I though we merited the point in the end."